The first teaser trailer for Star Wars Episode IX is finally here, along with its official title, The Rise of Skywalker. And boy oh boy is there a lot to talk about. Let’s start with the title. Given it’s the conclusion to the Skywalker saga in the Star Wars universe, it’s a fitting name, and there are a few theories bouncing around about what it could mean. The most obvious – and perhaps most likely – is that it alludes to Kylo Ren’s redemption arc and the reclamation of his Skywalker roots. Some fans also think that there’ll be a twist revealing that Rey is a Skywalker after all. Plus there’s a cool theory suggesting that “Skywalker” will be the new name for Force users. It’s probably a combination of these (or something else we haven’t considered yet). The trailer opens with Rey on a desert planet, breathing heavily. It’s reminiscent of the opening of the teaser trailer for The Force Awakens, in which we saw Finn in a similar situation on Jakku. The planet Rey is on here could be Jakku, or maybe Luke Skywalker’s home planet Tatooine – or it might be an entirely different desert planet, of course. But Jakku or Tatooine would both provide nice full circle moments. Over these shots, we can hear Luke in voiceover saying “We’ve passed on all we know. A thousand generations live in you now. But this is your fight.” Presumably, this is Luke speaking as a Force ghost. He sounds confident that Rey is ready to face whatever is coming next. And indeed she is. Rey pulls out Luke’s lightsaber, which has apparently been repaired since it was smashed apart in The Last Jedi. Rey’s approached by a TIE fighter which is maybe, probably piloted by Kylo Ren. She runs from it, but of course she can’t outrun it – leading to the most epic shot of the trailer, in which she flips through the air and over the fighter. We then see an unidentified vessel approaching an unknown city at night, followed by Kylo Ren leading a First Order attack on a forest planet. He stabs a hooded figure with his lightsaber. Meanwhile, the helmet Kylo Ren smashed after Snoke made fun of it in The Last Jedi is being repaired by someone with very hairy hands. Then there’s a shot of Finn and Poe, seemingly on the same desert planet we saw Rey on earlier in the trailer. Finn is holding Rey’s staff. We then see BB-8 with new, adorable droid D-O. This is followed by a shot of Chewie piloting the Millennium Falcon, with none other than Lando Calrissian by his side. Original actor Billy Dee Williams reprises the role, and seems to be overjoyed to be in the Falcon’s cockpit again. In an emotional moment, we see what appears to be Leia’s hands holding one of the medals she gave Luke and Han at the end of A New Hope. She’s no doubt mourning what she’s lost. Then there’s a shot of Leia embracing Rey. Rey sheds a tear (and so do I). This is likely rejigged footage from Leia and Rey’s embrace in The Force Awakens, and it looks pretty incredible. These closing shots of the trailer feature Luke’s voiceover again saying “We’ll always be with you. No one’s ever really gone.” Which sounds all nice and comforting – until we hear EMPEROR PALPATINE’S EVIL CACKLE. IS HE BACK?!?!? WHAT DOES IT ALL MEAN?!??!?! 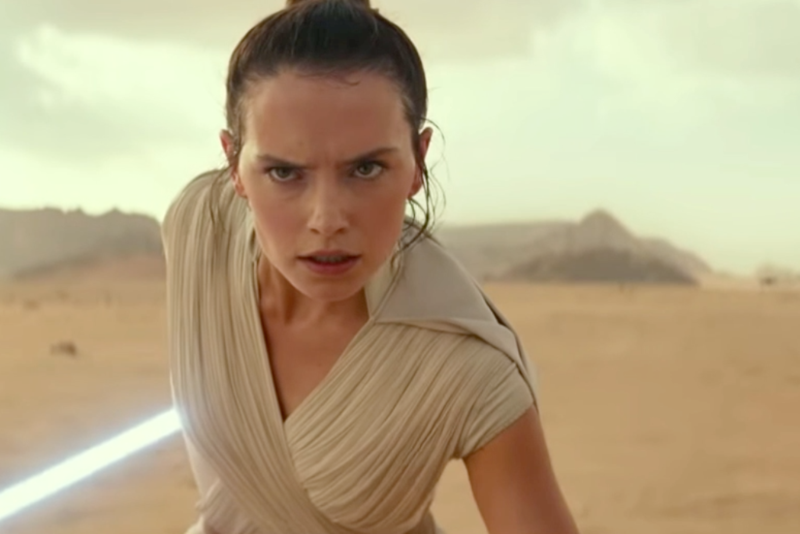 One thing’s for sure – the teaser very much blends the past with the present and hints at the future, indicating that while nostalgia and the lessons of what has come before will play a big role in The Rise of Skywalker, the movie should bring the current generation’s story to a satisfying conclusion as well. Star Wars: The Rise of Skywalker hits cinemas in Australia in December.